In May 1939, an 18-year old Jewish boy, Kurt Kriszhaber, left Vienna for England to escape Nazi persecution. In July 1940 he was picked up by the British government and imprisoned as an "enemy alien" . He was then transported on a 59-day hellish voyage to Australia where he was interned in a camp near Melbourne. His family remained in Europe. His mother had died when he was a boy of seven, but his father, aunts, uncles and grandparents were rounded up and murdered during the Holocaust. His half-sister Martha survived in Vienna despite frequent interrogations by the Gestapo. Kurt was eventually released and he joined the 8th Australian Employment Company and at the end of the war became an Australian citizen. But just when he was ready to start a new life, tragedy struck and Kurt died in an accident at his lodging-house. 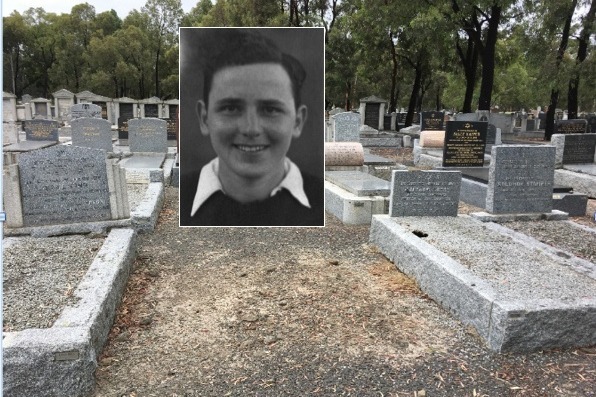 He had avoided the gas ovens and crematoria of Nazi Germany only to be gassed by a faulty heater while taking a bath in Melbourne, Australia. The irony of this event shocked me, but I was even more shocked when a relative of mine visited the site of his grave in Melbourne's Fawkner Cemetery to find there was no marker. You'll see it in this video and this is why I am asking for help - to honour the memory of an innocent victim of World War Two and the Holocaust - to give him back the dignity of his name. We have got to our first milestone - $1000 - but need your help to reach the goal. Please, take a look at the video, and if Kurt's story touches you, make a donation to make sure his name and life are never forgotten. I received a copy of a letter today from State Trustees in Melbourne to Fawkner Cemetery. They hold the right of interment for Kurt's grave and gave official "Consent for the placing of a memorial - right of interment of the late Kurt Kriszhaber. Grave: Jewish A, Row 06, Grave 781". We are up and running!